In our previous blog post on “dandifying Mageia” (nearly a year ago! ), we introduced DNF in Mageia 6 to the world. Since then, we’ve been keeping pace and tracking upstream development in Cauldron. By working closely with upstream and being actively involved in the development process (which involved reviewing and testing proposed changes), we’ve been able to ensure that the package manager evolves on the right track. This has led to benefits for both us in Mageia as well as Fedora and other projects using DNF (such as the Yocto Project, which adopted DNF with their 2.3 release). 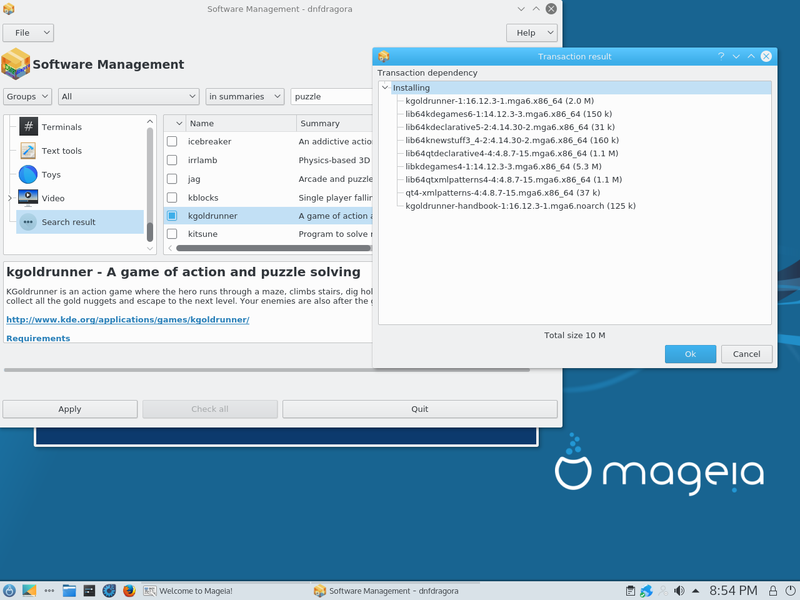 As a consequence of our work to bring you the latest and greatest of package manager technology, Mageia is pleased to be one of the first major Linux distributions to offer DNF 2.x on release! We currently have v2.5.1 of DNF, along with v2.1.1 of the core plugins and v2.0.1 of the extra plugins. DNF is also preinstalled with all fresh installations of Mageia 6, and for those who upgraded from Mageia 5, you can just install the “dnf” package to get it. For those who prefer a graphical experience with package management, we’ve developed dnfdragora to provide an intuitive graphical frontend similar to rpmdrake. Though unlike rpmdrake, dnfdragora provides native Qt 5, GTK+ 3, and ncurses frontends, so it doesn’t matter what you’re using as your desktop, you’ll have a nice experience with dnfdragora. Just install the “dnfdragora-qt” or “dnfdragora-gtk” packages for either frontend, or “dnfdragora” for ncurses only. For those makers and shakers of the world, we have several pieces of exciting news! We’ve completed the integration of support for Fedora’s COPR service, which means that anyone can now build packages targeting Mageia 6 and Cauldron today on COPR, alongside Fedora and CentOS. For how to use it, see our wiki page on it. We’re also pleased to announce that both Mageia 6 and the rolling target Mageia Cauldron are supported on the openSUSE Build Service. Because of the OBS interconnection capability, the vast majority of private Open Build Service appliances also now can build packages for Mageia 6 and Mageia Cauldron, too! For how to use it, see our wiki page on it. In addition, Mageia now fully supports AppStream, the cross-distribution standard for software authors to describe their software for software centers to use. 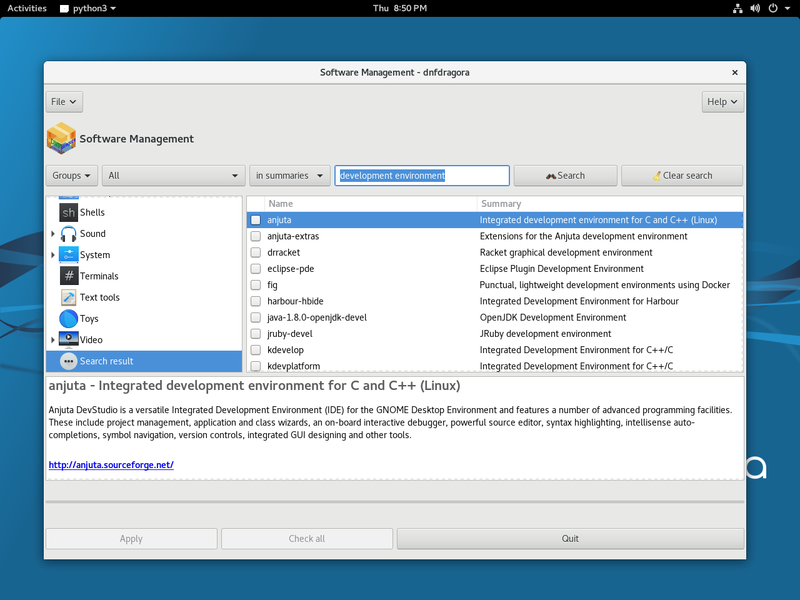 With Mageia 6, software center applications that use AppStream, such as GNOME Software and Plasma Discover, will be fully populated with a representation of the software we ship that provide AppStream information. 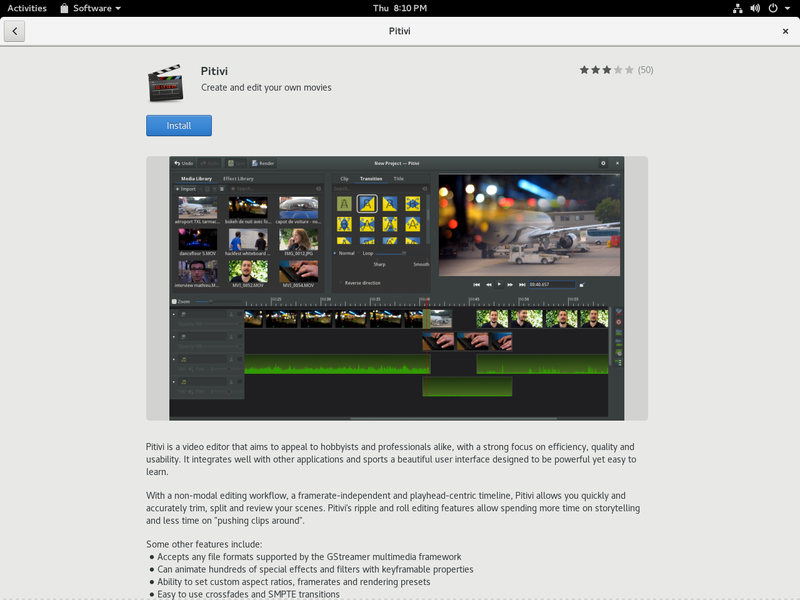 Just install the “gnome-software” or “discover” packages to check this out. 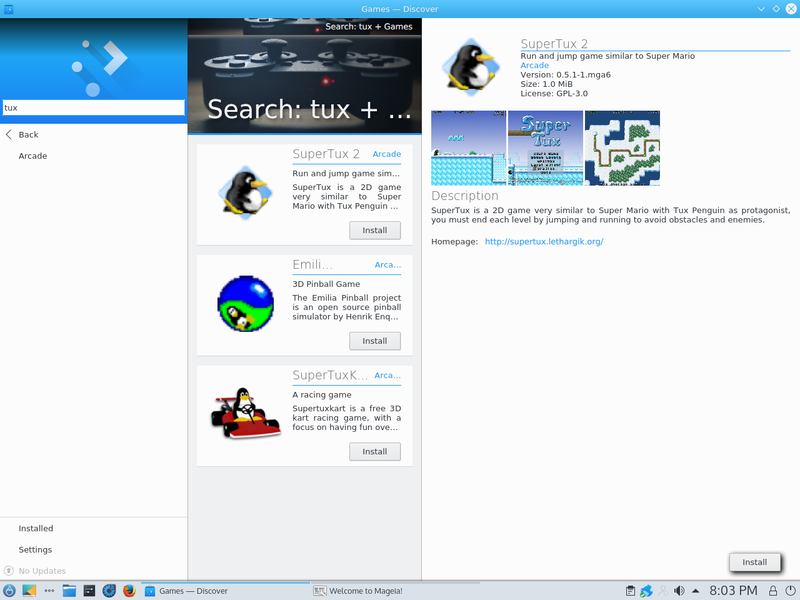 However, if you’re using GNOME and install GNOME Software, the GNOME Shell integration will activate the next time you log in, allowing you to use the GNOME Shell search to find applications to install from GNOME Software. To add a little cherry on top, if you use GNOME Software to manage your software updates, you’ll be pleased to know that GNOME Software’s Offline Updates functionality works perfectly! It looks rather spiffy, if I do say so myself! This is the culmination of two years of work in Mageia and various upstream projects to make this a reality. 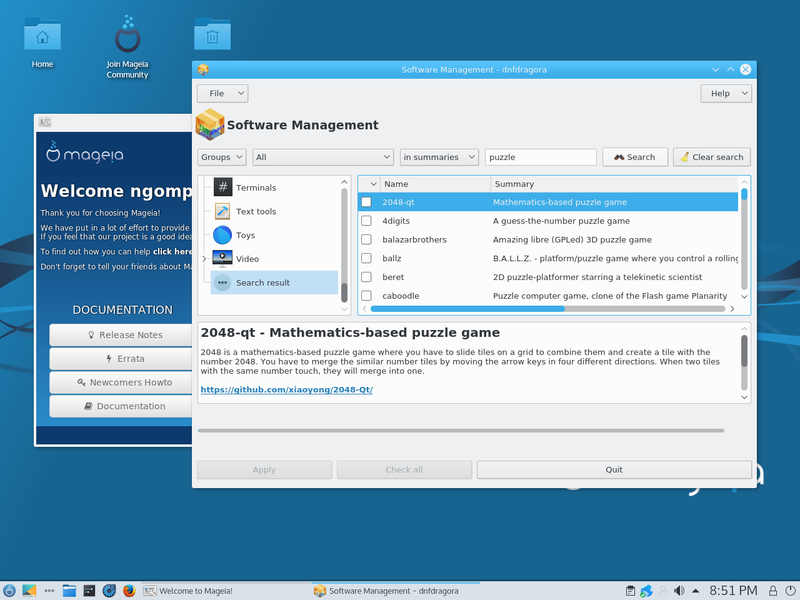 The upstream software developers, our friends in the Fedora Project and the openSUSE Project, the Mageia packagers, and the Mageia system administrators have all contributed to the success of this technology launching in Mageia 6. All of us hope that all Mageia users will enjoy this in the release of Mageia 6. This entry was posted in Collaboration, Mageia, packager, release, users. Bookmark the permalink. ← Announcing Mageia 6, finally ready to shine! Great news. I like it so much when distributions have common tools/strategy, and more generally when people manage to work together in the same direction. My favourite distribution is Mageia, with OpenSUSE and Fedora as second best. So this DNF thing is really nice ! The second dnfdragora proposing to install “kgoldrunner” in Qt mode, is supposed to be GTK3+ or not? No, dnfdragora is running in Qt mode for all “action” screenshots.